This is always my favorite guide to work on, mostly because it gets me excited for upcoming trips that we have on the books! I tucked that luggage scale in Dave’s stocking a couple of years ago after our first trip to Belgium. We were dinged with a $200 charge for overweight luggage thanks to all of the beer we were bringing back, and we didn’t have enough time to rearrange things between both of our suitcases. Oops! I chose items at a variety of price points with most coming in at $50 or less. I know how quickly gift costs can add up at this time of year! And, as with all of my guides this year, I’ve included a few unisex items because we’re not all shopping exclusively for women! Cold Brew Travel Kit – Hot coffee is totally overrated; I’m all about the cold brew! I love this travel brewing kit to make your own iced coffee on the go! Luggage Scale – As dull as this may seem, any traveler would be remiss not to have a luggage scale. It’s an inexpensive item that can save someone a lot of money on their next trip. 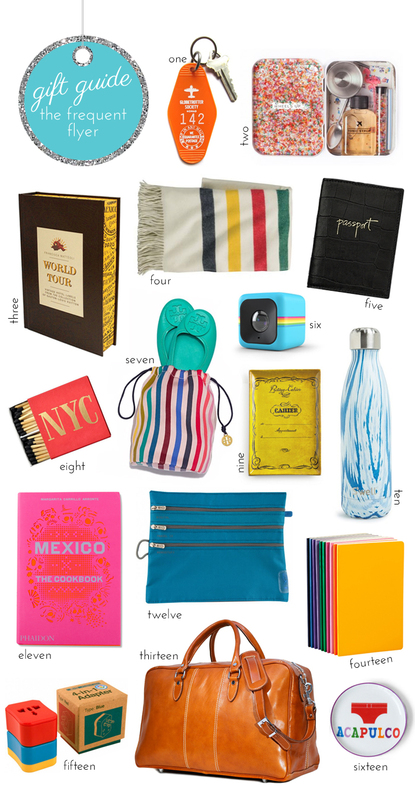 Travel Guide – If your giftee has a trip on the books, get him a travel guide to help with the planning process! The Monocle travel guides are the perfect of mix of practical and entertaining. Plus, they’re attractive enough to leave out on display. Luggage Tag – A leather luggage tag adds a luxe spin to a utilitarian item. You can have it monogrammed, too! If you really want to be a high roller this year, you can tuck a printed travel itinerary inside to surprise your significant other. Hand Sanitizer – I never thought I’d say that hand sanitizer makes for a great stocking stuffer, but just look at how pretty the packaging is for this one from Aesop. Travel Humidifier – I’m always complaining about how dry hotel rooms are, so I was really excited to come across this gadget the other day. All you need is a bottle of water to create a mini humidifier! It’d make a great gift for someone at work, too. Airport Map – NOMO came up with an artistic Runway Series to showcase the runways of major national and international airports. Once framed, it makes for a striking piece of art that commemorates a special trip or favorite location. And, while we’re on the topic of fabulous gift ideas, you just might be lucky enough to treat yourself to a pair of classic pearl stud earrings! Enter here! *You can try these free for a month with DITTO’s Endless Eyewear program. Just use code BEDKNOBS to waive the $24 fee for the first month! The e-tailer also has a selection of designer sunglasses on sale for 25% off right now! Today’s gift guide is one of my favorites: presents for the person who would rather be anywhere but home! 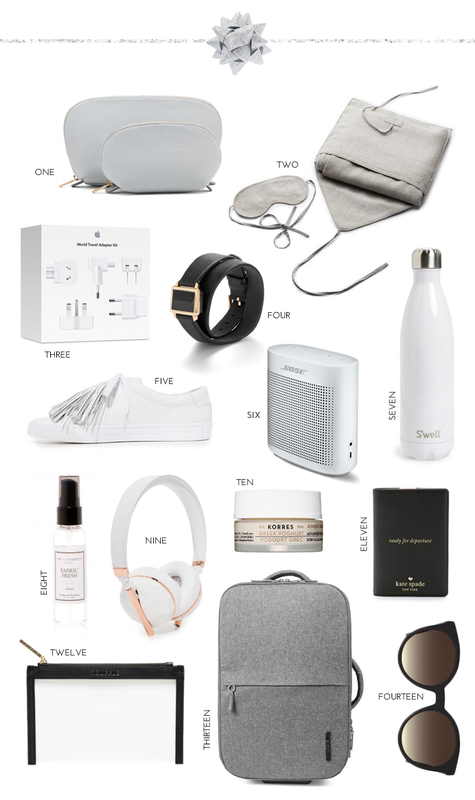 Opt for luxe, practical gifts the recipient can use on the road, like an in-flight organizer, travel flats, or a leather duffle bag. (I actually gave a Floto Imports leather weekender bag to Dave our first year together and loved it so much that I bought one for myself. It has held up beautifully over the years.) But, chances are your loved one can’t be on the road all the time and likely has a 9-to-5 to afford it, In that case, surprise her with trinkets to remind her of a special trip. I’m crazy about this book, a coffee table collection of vintage hotel labels amassed by Gaston-Louis Vuitton. There are also mugs with designs inspired by National Park stickers given to visitors in the ’20s for the outdoorsy traveler. I’d also be remiss if I didn’t mention these incredible cityscape rings by Ola Shekhtman.